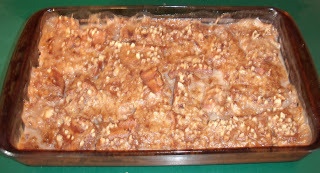 5) Cut bread into cubes about 1 inch thick and place on the bottom on a grease 9 x 13 ” baking sheet, in a side bowl combine ingredients to make bread pudding ( Soy milk, vanilla, syrup, walnuts and spices) Pour mixture over bread cubes and let bake for 40 minutes or until the liquid begins to bubble. 6) remove from heat and let sit (don’t worry if there is still liquid in your pan it will become absorbed once you let the dessert sit. I agree with OrganisedPauper, there is a great deal of sugar. Sugar scratches the heart and that is why all of us should be concerned about how much processed sugar we are getting. This is a fat-free vegan website, however, sugar has always been fat free and it has always scratched the heart. Who cares about how much sugar on a fat free vegan website. Go to a sugar free website. If you are eliminating fat, the flavor has to come from somewhere. Otherwise, just go eat fruit! Oh cool thank you for posting this such a wonderful recipe i relay love to cook i like to make variations with the ingredients and apple is my favorite fruit so thank you for such nice stuff with my favorite ingredient and i will surely try this at my home i am sure it will be delicious and my husband will definately say its YUM!!!!!!!!!! This was super delicious! YUM! That’s a huge amount of sugar!